eD@HoMe: A beautiful cover from Liechtenstein! Here's a cover posted from the sixth smallest yet one of the richest country in the world, Liechtenstein! Many thanks to Vural Oguz!! 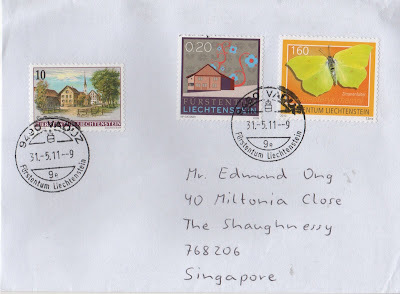 The beautiful stamp on the left belongs to the "Views of the Villages" definitive series, issued on 4th March 1996. The stamp in the middle was released in 2009, the third series of stamps under the theme "Brand Liechtenstein". It features the 'Red House' in Vaduz built in the 13th century and which has been in private hands for over 200 years. The right stamp shows the magnificent Yellow and black Swallowtail butterfly which is native to Liechtenstein. It belongs to a set of 3 from the "Butterflies II" series, issued in 2010.